Here’s a copy of our monthly Geordie Chapter Newsletter. We’ve got a great round-up of the year from some of the Geordie Chapter Committee, and a look-ahead to what’s in store for 2017. ‘Here’s to twenty years – 1997 to 2017! We’re looking forward to celebrating our twentieth anniversary next year and early indications show that it’s going to be one of the best yet! 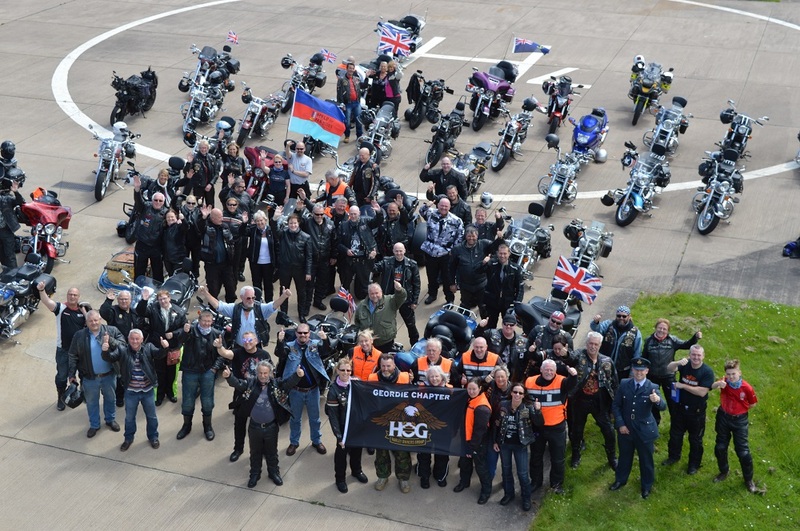 2016 has been an amazing year for the Geordie Chapter – we managed to do all sorts of things from Chapter ride-outs, rallies, charity events and most recently, our superb Christmas Party. Our Activities Officers, Peter and Helen, managed to keep the Calendar stocked full of great events to suit everyone. Our membership has increased considerably during 2016 and now stands just short of 250. I would be so proud to see us break the 300 barrier once again – hopefully we will manage this during 2017. So come on, let’s all encourage everyone who is buying bikes or trikes to join the famous Geordie Chapter and get involved in the fun. Jennings Harley-Davidson Gateshead is also doing their bit to encourage new members to join the Chapter. They are giving all new members a 50% voucher towards their first year of membership. This is great news for us, and apparently not done at any other chapter in the country. Fifty-four Chapter members took part in the 2016 H.O.G. Chapter Challenge and between them, managed to ride more than a quarter of a million miles. This was a fantastic result and we’ll be entering the challenge again. Keep an eye out for the forms coming round early next year. Thanks to everyone’s generosity, we managed to raise £2,350 for various charities throughout the year, starting with the Great North Air Ambulance back in May. This contribution forms part of the c. £25,000 raised by the clubs in the North East Coalition of Motorcycle Clubs (NECC). Paul and Lesley McPherson also raised an astonishing £4,000 in one night that they split between Gibside School and our Geordie Chapter mascot, Harley Stallard. In July we saw our new dealership open, Jennings Harley-Davidson Gateshead, with its state of the art, high-spec store and the very latest Harley-Davidson motorcycles. They’re currently underway with their new workshop facilities, to service our bikes and trikes. I would also like to thank Jennings Harley-Davidson Gateshead for their contribution to the Chapter over the past six months. 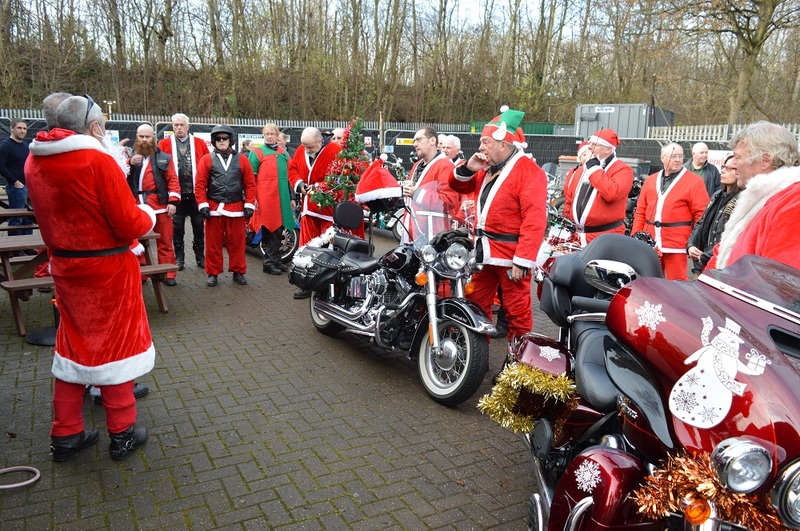 They contributed a superb £450 jacket as the main prize at the Heart & Soul Rally, gifts for our Santa Ride, and money prizes for our annual mileage awards. It’s great to have their support. Most recently, we had our annual Santa Ride. In all my years as a Chapter member, I have never seen such a great amount of gifts given by everyone. The ride to the hospital was spot on and this year the weather was really kind to us. A sincere thank you to everyone that took part. The amount of gifts people donated for the Salvation Army was astonishing. In 2017, Percy Park will again host the Heart & Soul Rally. We’re looking forward to seeing everyone, including our friends from the Bergen Chapter who will be visiting us. I am so looking forward to catching up with them, sharing stories and building relationships for future events. Our 2017 Events Calendar is quickly filling up with something for everyone to keep us on our bikes, having fun. And in February, we have our AGM. I would like to discuss a few items with you all, so please try and come along. ‘As we come to the end of 2016 and take time to reflect on chapter life and the numerous events, activities and rallies we’ve all enjoyed this year, it’s good to see we’ll be repeating most of these in 2017! Early 2016 saw us take part in the CRAGG event, at Gretna, for the first time. The weather was against us at times but it now looks like it’s going to be a well attended annual event. We found out that the Bailey Mill venue for our camping weekend wouldn’t be available this year, so in July we went to Clennell Hall in Northumberland. We had a fantastic time with entertainment provided by some of our talented Chapter musicians and equally talented staff of Clennell Hall. We partied well into the small hours and then Shaun treated us to a fantastic rural scenic ride-out on the Saturday. We are returning in 2017 and hopefully we will make this another annual event. There’s still plenty camping available for anyone wanting to join us, so just give me a shout. The Chapter BBQ is now, if memory serves me right, in its sixth year and still very well attended by everyone. I could go on and list a few more events, but I’ll point you all in the direction of the Chapter website and our Facebook page where we’ve listed all the activities, ride-outs and events for 2017. ‘I write this in the middle of sorting out the end of year accounts for the Chapter, which we’ll publish in January 2017, and I am happy to report that they will again show the Chapter in a healthy financial position. We had a considerable turnover in 2016, and an improved final balance in our accounts. I can report a significant increase from when I first took over as Treasurer when the Chapter re-formed. The role of Treasurer includes overall financial management of Chapter finances rather than just accounting for money received and spent. Our healthy financial position has allowed us to reduce the cost of membership by £5.00 to £15.00, for an individual member. At the same time, we have been able to give back some benefits to everyone, such as pie and pea suppers and curry, at some chapter meetings this year. We also gave a £10.00 discount on the Chapter Christmas Party tickets. Members taking part in all of these events have received a benefit of £22.00 each, which is pretty good value for the £15.00 subscription – especially when taking into account the other chapter activities and rides in the course of the year. 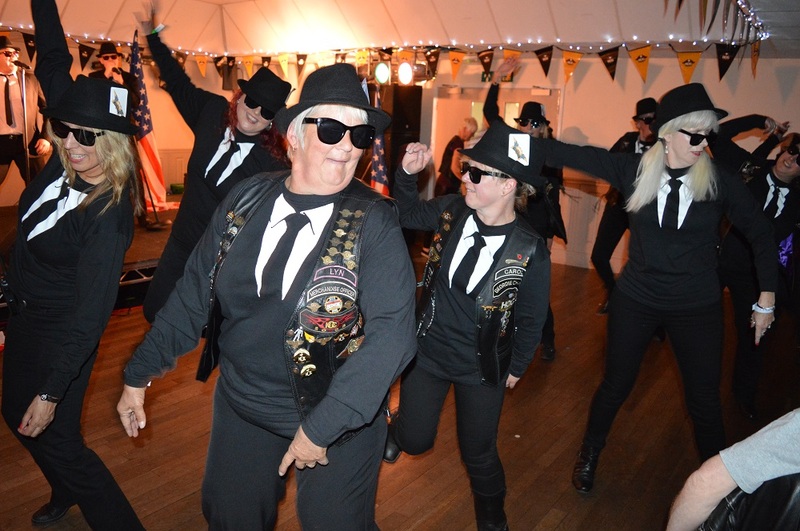 Not least of these Chapter activities was the Heart & Soul Rally which was a resounding success thanks to Dawn, our Rally Coordinator. With careful financial management, we were able to ensure it was a financial success, rather than a cost to the Chapter. I have been Treasurer now for four years and as I am well past retirement age, I will be stepping down next year. I will be handing the reins over to Gary Robinson. ‘As 2016 comes to an end, it’s time to reflect on the past twelve months. This year not only sees my first year as an L.O.H. Officer but my first complete riding year and I’ve got to say I’m very pleased with my 6,000 riding miles! We’ve continued to expand our L.O.H. members, welcoming more riders and non-riders throughout the year (to be an L.O.H. member, you first need to join H.O.G. as a full or associate member, then join our Chapter). Our communication with other Chapters has never been better. The welcome we received from the Brescia Chapter, during our annual holiday to Italy, completely exceeded my expectations. If anyone riding abroad would like help locating and arranging to meet overseas chapters, I’m only too willing to help. I attended my second national L.O.H. Meeting in October, meeting up and discussing ideas for 2017. One of these is a national Sparkle Ride, scheduled for September, and I will be discussing this with the five northern Chapters to plan the weekend – more details to follow shortly. We’ve had quite a few articles in the L.O.H. section of the HOG magazine and H.O.G. Insider, so please keep forwarding your stories and adventures to me to get them published. We are the host Chapter for the 2017 H.O.G. Directors meeting in January and plans are coming along nicely to include a visit to our fantastic new dealership. To entertain partners during the weekend, I’m arranging a Cocktail Masterclass at Newcastle’s Revolution Bar and hope many of our Ladies of Harley will join us. ‘Our merchandise sales have never been better, with my stall at the monthly Chapter meetings, the rally and our online shop. We’ve recently expanded the range of Geordie Chapter items to include silver rockers to match the H.O.G. silver Eagles. They are available in large and small. We’ll have these available online soon. I can also order name rockers (just in case you forget your own name!) and there are lots of styles etc. available. If you’re looking for a specific something but can’t find it, just get in touch and I’ll see if I can get it for you! ‘Our website continues to develop, and I’m adding lots of new content all the time. It’s open for everyone to read and is a great way of encouraging new members to join the Chapter. I do a lot of research and upgrades to ensure that our website is one of the best! I’m hoping to refresh a number of the pages early in 2017, making sure that everything is right up to date and meets the various requirements of regional and national H.O.G. There are quite a few guidelines in place. Finally, thanks to Cross Rob for the pictures in this month’s Newsletter. We’ve got a Chapter Meeting at Nissan SLC on 5 January 2017, getting underway at seven-thirty.